It’s Friday! Congrats to Jone MacCulloch, who’s won a copy of The Way Back from Broken. Jone, send your address to publicity@lernerbooks.com and we’ll get your book in the mail! 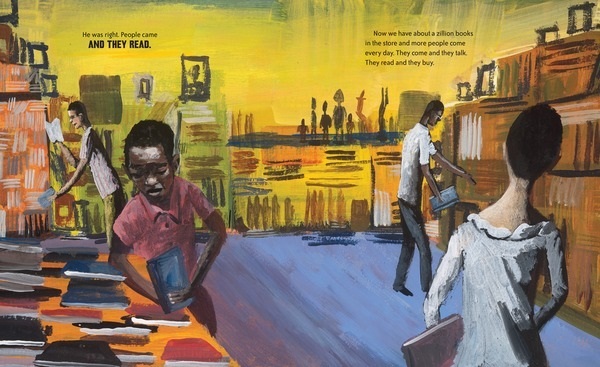 Our giveaway this week is Vaunda Micheaux Nelson’s The Book Itch: Freedom, Truth & Harlem’s Greatest Bookstore, with illustrations by R. Gregory Christie. In the 1930s, Lewis’s dad, Lewis Michaux Sr., had an itch he needed to scratch—a book itch. How to scratch it? He started a bookstore in Harlem and named it the National Memorial African Bookstore. And as far as Lewis Michaux Jr. could tell, his father’s bookstore was one of a kind. People from all over came to visit the store, even famous people—Muhammad Ali, Malcolm X, and Langston Hughes, to name a few. In his father’s bookstore people bought and read books, and they also learned from each other. People swapped and traded ideas and talked about how things could change. They came together here all because of his father’s book itch. Read the story of how Lewis Michaux Sr. and his bookstore fostered new ideas and helped people stand up for what they believed in. If you’d like to win The Book Itch, please leave a comment on this post (including your first and last name), or tweet this line: Free Book Friday! Tweet to win THE BOOK ITCH from @LernerBooks. bit.ly/1OrSN Make sure to check the blog next week to see if you’ve won! To read more about Vaunda and The Book Itch, here’s a Q&A we did with her in August. This would be a great historical fiction book to add to my library!